Toys. Figures. Statues. For the past ten years, designer Woong Cho has collected memorabilia. And he decided he wanted to share his passion with the world. So, Cho created a restaurant with an amazing museum. It's dubbed "CW Restaurant", which is short for "Cinema World", and is in Daegu, South Korea. The chic eatery is filled with a variety of collectibles from Star Wars, Terminator, Marvel, Pixar, and more. It's as much a fashionable cafe as it is a tribute to geek passion. According to Cho, his collection wasn't something that he could simply do with time and money—though, I bet neither hurt. Instead, he says, "Only strong commitment and endless enthusiasm to build a place and share all these things with you made this possible." The second floor houses a café and a restaurant. The third floor is home to Cho's amazing collection. Many of the items are limited edition, and a few of them, he had custom made, such as the Wall-E model. According to Cho, a Saudi Arabian collector offered him a million bucks for the entire Star Wars collection, but Cho politely turned the man down, saying it meant too much to him. "I created CW to represent my youth, that child in me," said Cho on the restaurant's official page. "I hope to spark the imagination within children and also inspire a child-like mindset and bring back forgotten memories to adults." Apparently, the restaurant is getting excellent reviews, and the food's pricing is competitive. Even if you don't sit down for a meal, you can still visit the third floor museum. 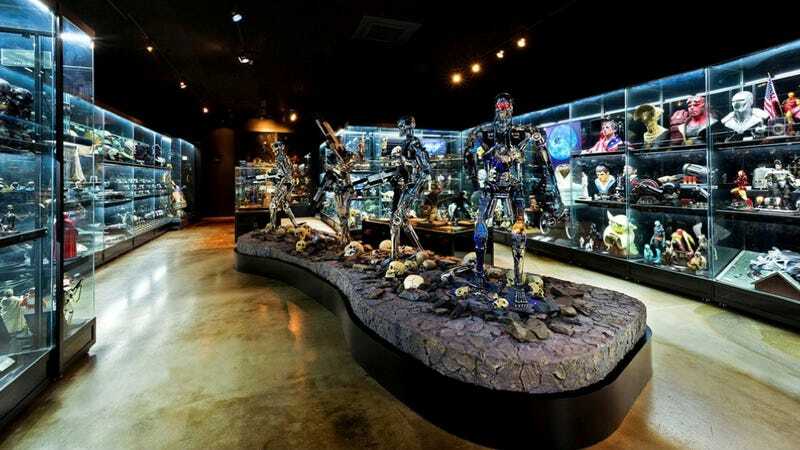 It's apparently the only sci-fi memorabilia museum of its kind in South Korea! Using today's exchange rate, the entrance fee is around $3 for adults and approximately $2 for children.